The latest Android phone from the Korean company that slavishly copies Apple. 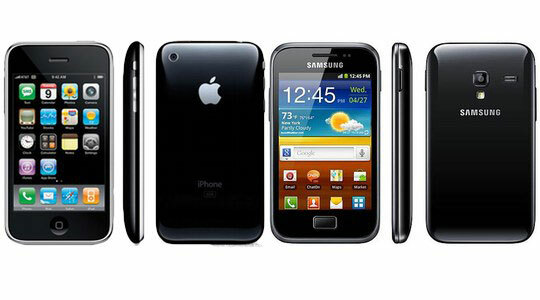 Noted by Cult of Mac “Samsung Is Now Shamelessly Ripping Off The Design Of The 4+ Year Old iPhone 3G”. This entry was posted on Sunday, January 8th, 2012 at 10:00 am	and is filed under Samsung, iPhone. You can follow any responses to this entry through the RSS 2.0 feed. Samsung and Google are beginning to make Microsoft look totally innocent! Apple should just nuke Samsung. The Design have differences, the camera, the camera flash, the main button design, the border curve and the back curve, the speaker, the position of logo and trademark, on the software usually every designer using icon as rounded square on apple, this a preference for every developer, the main OS icons of the ares different on both phone.